From Paris : Take Avenue Jean-Jaurès until you reach No. 221 (just before the Porte de Pantin roundabout). From the Paris ring road (périphérique) : take the Porte de Pantin exit. 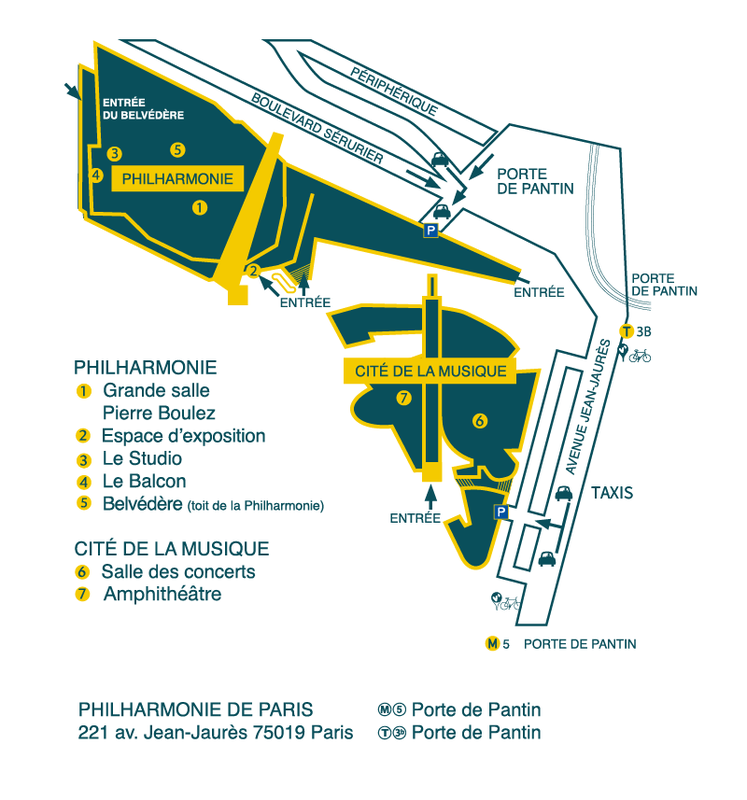 Direct access to Philharmonie Parking / Q-Park from the Paris ring road (Périphérique) and from the Porte de Pantin. 564 parking places, inculded 15 parking places for persons with disabilities, and 90 for two-wheel vehicles. Access to Cité de la musique Parking / Indigo from Jean-Jaurès avenue and from the Paris ring road (Périphérique). 348 parking places, inculded 10 parking places for persons with disabilities, and 10 for two-wheel vehicles. Book your parking space in advance (subject to availability) and in a few clicks, quickly and securely (up to 8pm, the day before your day car parking) and exclusively on parkingindigo.fr. Direct access to Indigo from Boulevard Mac Donald. Capacity: 2000 cars, 40 motorcycles. Book your place at parkindigo.fr. On the 6th floor of the Philharmonie de , the restaurant offers sweeping views of Paris and the Parc de la Villette. The restaurant and its terrace count 150 seats. This relaxed and contemporary bistrot offers you an original and innovative cuisine. An elegant setting beneath the portico, looking out at the plaza of the Fontaine aux Lions and facing the Grande Halle de la Villette.